Up early for some Go-Ape goodness with H. in Thetford Forest. Good fun, and nice to spend some time with just H. before her entry into the world of upper school. Lunch, played in the playground, home. Took a day off with the family; mail chew in the morning. Off to Anglesey Abbey for a wander in the gardens, babes played cricket, hide & seek - with Janine, George & Ben; Lee-Anne wandered around. Picnic. Mail chew, built the latest pieces of code, off into Cambridge; profiled this and that; caught up with Tracie & the office team. Great to meet up and talk with Ben & Graham from Linux Voice - got a paper copy of their magazine - and immediately got a solution for the Windows XP PtoV migration I so badly need to do to have access to my legacy testing environment on Linux; great stuff. More build, testing, marvelling at the awesome work done by Markus, Tamas & Kendy. Mail catch up, partner call, TDF Board meeting. Boggled at silver coated Ethernet cables: one born every minute: All audio cables are directional. The correct direction is determined by listening to every batch of metal conductors used in every AudioQuest audio cable. Arrows are clearly marked on the connectors to ensure superior sound quality. For best results have the arrow pointing in the direction of the flow of music. For example, NAS to Router, Router to Network Player. I have no idea how the engineers live with themselves. Built ESC bug stats; turns out Thursday is a public holiday. Great to see Andrzej's LibreOfficeKit work for GSOC starting to bear fruit with a Gtk document viewer widget underway - hopefully for GNOME Documents integration in due course; exciting. Emily over & babes watched Tangled in the afternoon; partner call in the evening. Worked the bank holiday; mail triage, breakfast, call with Kendy, Tamas, Tor; rendering and import profiling. Worked late. Off to NCC, Tony presenting a rather sensible plan on how to explore accomodating our growing church, at some length. Barbeque lunch, slugged vigorously and watched a fly on the wall documentary about waste water treatment; interesting. Bed early, dreaming of sewerage. Mail chew, slogged away at overcoming misc. build problems on Windows, after a lot of aggravation turned out I had some bogus glew DLLs in my user directory; fixed up path generation issues and suddenly the cppunit tests sprung to life. Poked at some GL / event issue for Markus, merged an ODS import performance fix, and ran some more profiling overnight. Booked the Eurostar for the Paris Hackfest - 27th-28th of June; looking forward to it - it should be fun. SOW review, filed an annoyance as an easy hack. Worked late. Mail chew, contract work, lunch. ESC call, pleasant catch-up with Chris Halls after a long break. Dinner, stories. Saw that Mat M has made a great start on a tool to Find LibreOffice code from dialog strings which is really neat. Amazed at the World's smallest nano motor nonsense; have they never heard of the amazing, self-assembling nano-electro-mechanical machine that is ATP Synthase and so polished there is almost no variation from bacteria to man. I'll sound like an old bearded hacker: "it's all been done before & better at that." Mail chew; found another 10% silly in ODS load-time thats worth getting rid of quickly. Partner call. Up late hacking at a fun parsing test. More calc ODS load performance prodding, found another couple of sillies and plugged away at them. Partner call, catch up with Philippe, chat with Florian & Sam. Bible study with Arun in the evening. Battled mail left / right, worked through some tasks, progress review call with Kendy & Markus, 2x team calls. Plugged away until late on Windows. Simply extraordinary that Windows' dlopen() call LoadLibrary not only appears to have a 260 character path limit (which we don't hit), but also a mystical, undocumented size limit based on the contents of PATH. Staggering, and horrifyingly awful not to be able to read the busted mess in-question to try to figure out how to work around it. Prodded at some silly performance pieces in calc ODS loading. Church for Hope's dedication service, home for a barbeque lunch, snoozed in the sun in the garden with J. very relaxing. Mended a broken swing; attacked babes with cold water. Amused having removed my soaked T-shirt, to be told by M. that I was odd because I didn't have any tattoes: o tempora! o mores! Off to Wicksteed Park with a set of girls to meet up with Claire & Alan & their brood. Much fun swinging on pirate ships, picnicing in the sun etc. Somehow managed to field 2x small, lost children weeping with no mothers in sight, and packed them off to the staff / police - heart rending. Mail chew, and nearly endless contract review; lunch, more dense verbiage chewing. Dropped babes at school; mail chew, train to London. Ran some profiles of large file LibreOffice / ODS loading - we need to migrate to the fastparser really. Met up with some old friends at Intel - good to catch up; on to another meeting, home late. Up late, rather groggy from lack of sleep; there is some irony that yesterday was the BBC's drive on "you should sleep more". Mail chew - and catchup from a day out. Partner call, TDF board call. Re-fitted the washing machine control electronics; Fitted new motor and re-assembled the Dyson - finally approaching the top of the household device energy peak again. Up rather early, drove to Bristol; a series of interesting OpenCL talks from various people; in particular great to hear about SPIR work - doing the hard/slow crunching where it is needed. Out for drinks afterwards with a great set of guys from CPU, to GPU, to FPGA vendors. Drove home exceedingly late for several hours. Mail chew, checked and pushed the i18npool speedup that should make mixed Asian text input snappier in 4.3. Team meetings variously. Drove to Oxford to meet Robert, as a way-point to Bristol for IWOCL. NCC: Ben & Miriam speaking on their work abroad - interesting. Home for lunch with Arun, Henna, Nigel & Naomi, fun. DVD later, quick tea, out for a drink with Ben, Mike & Nate in the evening - sleep. Up lateish; eggs for breakfast, slugged with the babes. Lunch, out to see Hannah, Nick & Joni - had a fine wander around Reach, cakes, back to our house for home-made Pizza. Mail chew, admin backlog catchup; chased some bugs, dug at a performance issue. Interested to see the Ubuntu Podcast Bjoern and I were interviewd in posted; some LibreOffice fodder there. Walked babes to school, and enjoyed M's Ancient Greeks assembly. Mail chew, partner call, mail production. Started work on an 'infinite monkeys' regression test: find buttons in the UI and press them, type random text into boxes we find, spew events left and right etc. Made a start at least - turns out I should have learned to read asian languages if I wanted to understand random UCS2 words. ESC call; wrote up minutes; worked late. Washing machine continuing to wash without making enough noise (like the startling absence of noise in the Prius - I feel that a 1k RPM spin should make significant noise - perhaps we should shake the wall & floor electronically). Mail chew, built ESC bug stats & agenda - looks like we lost a few MABs as 4.1 reached end of life; good. 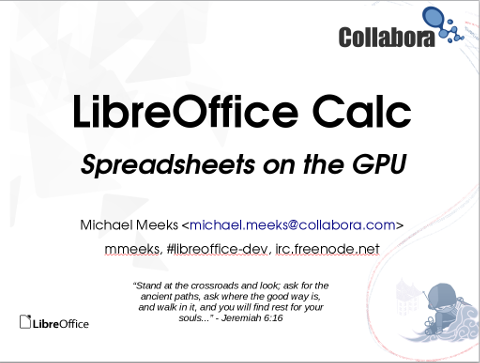 Great to see the Hexus write-up of the great work done by the LibreOffice team from Collabora / MCW / AMD team on Calc / OpenCL integration and core re-factoring. Got through the admin backlog to the point of boredom; partner call, merged a few patches. Prius+ 12V battery flat - hmm, another instance of Toyota's preferred (semi-audible) warning noises on exit ? or something else? Set too charging it in situ. DirectLine generously paid both the recovery fees required to get us home after an initial quibble; the moral - don't assume that RAC recovery recovers you in case of an accident, and don't assume that your insurer will pay a recovery fee they did not arrange. Mail chew; worked on a proposal; lunch. More slideware etc. Partner call. Dinner, Arun over for bible study; re-plumbed in, and connected washing machine - amazingly quiet spin: almost no noise at all: extraordinary, no obvious leaks either. Mail chewage; catch-up with Julian. Plugged away at the washing machine - cleaned the sleeves up and got the new bearings tapped into place. Lunch, team meetings more mail. Machined some new metal-work to replace the bits that are rusted through. Worked until late re-assembling the beastie of a machine - turned out I'd pulled off the vital spade from the heater element while disassembling: urgh, eventually M4 tapped the protruding end of it and bolted the connector on. Off to NCC via picking up N's friend Cassidy. Simon spoke, back for a big lunch with B & A. Managed to drive one bearing out afterwards by cranking and grinding the driving rod; attacked the other - no joy - an hour+ of attacking it together with grinding wheels later - managed to crack it, and drive it out too - phew. Poked at the car with Bruce, played with the kids a bit, tea, put babes to bed, sleep. Horrible night, lots of poor young people suffering on the ward around the place, woken each hour to tend to E. but by the morning E. getting out of bed and trotting around much more confidently. Turned my back & found her on a tricycle (doh). Discharged remarkably rapidly - good; home. Rang round for a bearing puller, no joy until I got to Bruce - who has four, booked them for tomorrow. David Mansergh came round, enjoyed playing with the power-washer cleaning the 'scale' off the washing machine innards, and (inadvertently) cleaning the patio underneath - what a machine. Bed early, exhausted. Merged a nice patch from Jeroen Nijhof to speedup the German comment counting - hopefully we can get much more recent and accurate stats there if we're lucky. Mail chew. Call with Kendy. Tried whole set of friends and neighbours for a bearing puller - no joy; will have to make one & weld it in I suspect. Call from J. - E. broken her arm badly and off to hospital in an Ambulance, operating theatre etc. Collected babes from school, fed them & hot-footed it to catch up with a brave baby. Stayed on the ward with her - tending variously to the needs; hourly checks on fingers. Rather a nice ward. Train to Weybridge with Tim, and back into central London for a rather encouraging partner meeting; fun. Worked through paper and legalese on the train back. Read stories, dinner, partner call late.